The CH-803 A Technica was introduced on the market in 1957. Also known as K 803, this model was very innovative. It is a 8mm machine and has a turret with three lenses: a Cine Arco 1:1.4 13mm, a Cine Arco 1:4 6,5mm and a Cine Arco 1:1.4 38mm. The "Technica" has a type of reflex viewfinder. On the turret there are three additional small viewfinder lenses. A selenium exposure meter was built into the camera and the operator can "read" the light on the body, by a little red needle. 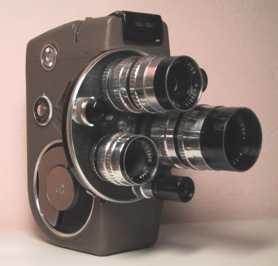 The movie camera has a brown metal housing. Its weight is kg. 1,600 and its size is 57x145x150 mm.